After a solid month on the road, the Rocky Mountain College basketball teams geared up for several home matches in February. The Women’s Basketball Team found their stride with back-to-back home wins after struggling on the road for the last four games. These losses included: Montana Western (47-52), Carroll College (50-71), and the past weekend’s matchups against Lewis-Clark State College (54-64) and Montana Tech (57-65). Juniors Mikayla Jones, Keisha Engelhardt, and sophomore Hailee Farstveet are the top three scorers for the women’s basketball team this season. Jones averages 14 points per game, Engelhardt averages 13 points per game, and Farstveet averages 9 points per game. The women snapped their losing streak at home with an upset win over 11th ranked MSU-Northern on February 2nd. Four players had double digits in the game. Freshman Markaela Francis had a career-high of 14 points, sophomore Justyn Juhl scored 12 points, senior Jayde LeFevre scored 10 points, and sophomore Hailee Farstveet lead both teams with the game high of 21 points. The team was 73 percent from the 3-point range, 76 percent for free throws, and 44 percent from the field goal range. The women built momentum from their Thursday night win on Saturday night when they took down the University of Great Falls 68- 56. Farstveet played a big role in the win over the Argos when she tied together two nights of scoring over 20 points for Rocky. “We did a good job of taking care of the basketball, and just an over-all good team effort. Everybody is starting to get a better feel for their roles on the team,” said Head Coach Wes Keller. Sophomore Alecia Chamberlain scored 11 points for the Bears, senior Jayde LeFevre scored 12 points, and freshman Markaela Francis scored 13 points. The women were 37 percent on field goal shots, 33 percent on three-point shots, and 88 percent on free throw attempts making 24 of 27 free throws. The women return home on February 9th and February 11th for games against Carroll College and Montana Western. 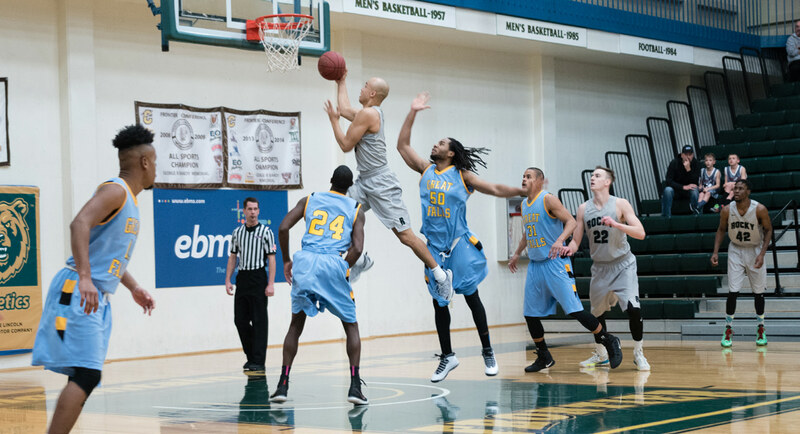 The RMC Men’s Team took losses on the road toward the end of January. These included matchups against #9 Montana Western (80-92), and #13 Carroll College (78-72). The men split games on January 28th and 29th, falling to Lewis-Clark State College (84-90), and finally pulling themselves out of their slump with a 71-58 win over Montana Tech. Junior Chad Kananen scored 15 points on the night, seniors Taylor Longo and Riley Bradshaw added 14 points and 13 points respectively, and senior Derek Graves scored 12 points for the men in the victory over the Orediggers. The Battlin’ Bears were 44 percent on field goal shots, 42 percent on three point attempts, and 78 percent on their free throw attempts. On Thursday, February 2nd, the men fell to MSU-Northern 61 to 66. The Battlin’ Bears shot just 44 percent from the field goal, 28 percent for three-point shots, and 83 percent for free throw shots. Senior Zachary Hinton shot a game high of 29 points on the night, and senior Derek Graves scored 12 points. The Rocky men would recover from their Thursday night loss on Saturday night with an impressive 83-69 win over the University of Great Falls. Senior Riley Bradshaw banked a career-high of 30 points for the Battlin’ Bears. “Riley had a great game tonight,” said head coach Bill Dreikosen. “Danny [Betcher] played well too, we had good hustle plays that scored us some points.” Sophomore Danny Betcher had a double-double on the night with 12 points and 10 rebounds, and senior Zachary Hinton added 11 points on the night for Rocky. The men will return to Fortin again on February 9th and 11th to take on Carroll College and Montana Western.